Any one going off road on Saturday? I'm itching to get my 990 dirty. Or any route suggestions would be appriciated. I am not sure that I will be out this weekend but I have written a route which might be suitable for you. The route does go past and miss out a few other lanes but at this time of year and on a large bike they might not be suitable. I do not know your capabilities so please do not be offended. Anyway there is route for you which you can view or download from ViewRanger, "Winter Big Bike Run starting at Tissington". Last edited by Hugh on Fri Dec 01, 2017 2:44 pm, edited 1 time in total. Many thanks Hugh, really appreciate your time and effort. I understand that you have got your Suzuki now and that you are thinking of fitting heated grips. If you are thinking of fitting additional items too then it might be worth your considering the fitment of an additional fuse box, which can be ignition controlled, to keep everything neat, safe and secure. Always solder joints to make strong physical connections and ensure good electrical continuity plus use shaped insulator covers. Keep live feed to fuse holders as short as possible and pack spare fuses in a sealable waterproof bag, tape it to the lead or similar. Try to run cables up the main frame under the petrol tank, not too tight or short that the cables come under tension with movement of the suspension and steering. I bought a cheap (£45) Oxford pair of heated grips, and they are very good, no problems so far .. just fit to handlebars and connect 2 wires [+/-] to the battery. Its a better earth connection this way too, rather than connecting to the bike frame, I found. 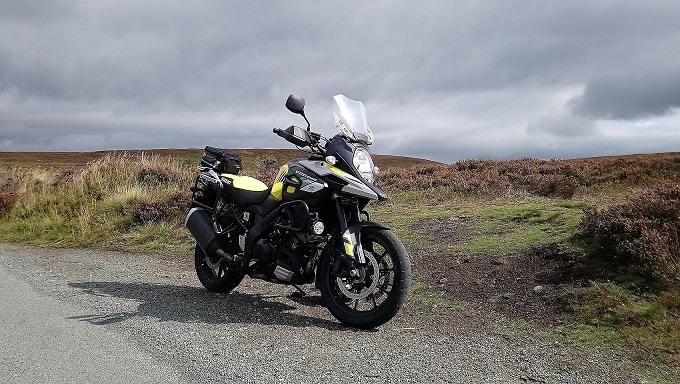 good luck with the DR .. good bike, great engine, but keep on top of maintenance (carb, brakes, suspension, bearings, etc and fit good knobblies (MT21/ Mitas E09/ IT/ XT644 whatever) as 50/50 tyres are not so good for more difficult trails (my own opinion). when you are happy with the bike, do a few easy tracks, like you been doing, then join a club, like the local trf or local bods. Thanks Hugh and Garyboy for the info. The DR arrived last night and took it for a spin around the block this morning. seems fine, bit different from the 990! The place I had it from put a years MOT on it and new brake pads. But I do need to move the gear change and put some decent hand guards on. I set off from Tissington OK. Crossed the ford, OK. Found the track on the other side of the road, after almost going down the cycle track The lane was slippy wet and rocky, so let some air out of the Mitas stood up look well ahead, let the bike do the work, and got to the top Then ploughed across the next bit, muddy. At the end of the tarmac bit that followed the satnav kept telling me to do a u turn, so I ignored it. On the lane leading to New House Farm there was a sign saying private road or something similar. It's at this point that I won the Muppet of the week award. I ignored the satnav and was to lazy to get the map out. Assuming that the faint track to my left was the way to go, so off I went following another persons tyre tracks. Steep down hill and muddy at least I didn't fall off. Once back on Tarmac I followed my satnav, which led me to the ford again I decided to call it a day and went for coffee.